Does Mucinex Help In Tinnitus? The use of Mucinex for tinnitus relief finds a fair number of recommendations from people who have been suffering from tinnitus induced by a sinus condition. To appreciate this, the nature of tinnitus has to be understood. Tinnitus is a medical condition that is characterized by ringing, buzzing or humming kinds of sounds in the ear, in the absence of any external sounds. There are several varied causes that can trigger off tinnitus symptoms; but what in effect these causes create is an abnormality in the way sounds signals are delivered to the brain. In the context of a sinus condition, this situation typically happens when the mucous membrane swells up as a result of sinusitis , and ends up exerting excess pressure on the auditory pathways, especially the Eustachian tube that is responsible for maintaining optimum pressure on both sides of the ear drum. Consequently the sound signals originating in the ear gets distorted. Additionally, the sensitive nerve ends start to pick up low frequency sounds that it would normally overlook. Such conditions create the annoying sound of tinnitus. Depending on the severity of the congestion, the intensity and pitch of the tinnitus sounds can vary in different people. · Mucinex is a drug that acts as an expectorant. It is used to loosen phlegm and makes it easier for the body to get rid of it. · Mucinex is known to provide quick relief during cough and cold. · The relation of mucinex to tinnitus is an indirect one because this drug is primarily used to decongest a nasal block created by a sinus condition. · The quick decongestion that mucinex provides releases pressure on the auditory pathways and can bring relief or terminate tinnitus sounds (that are of cold and cough origins). The use of mucinex to bring relief to nasal congestion as well as for tinnitus requires the sanction of a physician. Self medication using mucinex is not recommended since there are several side effects that the use of mucinex can trigger. Apart from guaifenesin, the drug mucinex contains other ingredients that can potentially lead to drug reactions especially on those who are susceptible to some conditions such as bladder irritability, blood pressure related problems etc. 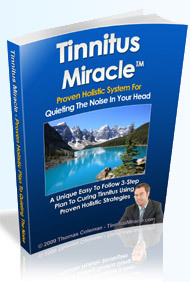 A holistic and multi disciplinary treatment of tinnitus can offer great relief from the annoying tinnitus sounds. This option certainly does not contain the risks of side effects that drugs typically contain.